The Coen Brothers rarely, if ever, make a bad movie, and No Country for Old Men, isn’t bad, too. It meanders a bit, and it relies on its MacGuffin a little too heavily, but it’s good at conveying the sparse and bleak world of a Cormack McCarthy novel. There are three stories in No Country for Old Men. The first follows sociopath Anton Chigurh (Javier Bardem) roaming the American West murdering people with his air-powered bolt-gun. More on him later. The second features Llewelyn Moss (Josh Brolin), a jack of all trades living in a trailer and off the land. Out hunting, he discovers half a dozen corpses, the aftermath of a drug deal gone bad. Following a trail of blood and footprints, he finds a case full of drug money and brings it home. All in a day’s work. The third story involves Sheriff Bell (Tommy Lee Jones), a competent, methodical man who always seems to be one step behind the other two. Then again, he’s at the age where he’s thinking more about retirement than about his work. The three main stories come together as you might predict: Chigurh is trying to retrieve the drug money from Moss, and Sheriff Bell is investigating both of them. There are plenty of subplots and side-characters as the three men circle each other in the desert. From the little I know about Cormack McCarthy, No Country for Old Men fits him well. The visual style and the story are bleak. The tone is fatalistic. There are empty roads, distant horizons, and vast spaces. There are lawless men and impotent lawmen. There are missed connections, lost opportunities, and moral failings. It’s a world of bad men that’s easy to get trapped in and impossible to escape from. McCarthy’s bleak setting is offset by the Coens’ light touch. They add a little bit of levity, for example, in Bardem’s mop of a hairdo, in the deadpan reactions of the colorful and clueless supporting characters, and in the fashions of the early 1980s in Texas. The film’s best performances are from the minor characters. Tom’s older brother seems to have a genuine Texas accent from a lifetime on the ranch. Same goes for Llewelyn’s trailer park manager who puts a glottal stop in the word “int’formation”. Then again, if you’ve seen Fargo, or O, Brother Where Art Thou? you know that the Coens are good at regional American dialects, which does as much for authenticity as cars, costumes, locations, and hairstyles. People love to praise Tommy Lee Jones, and indeed he’s very good at what he does. Yet he always seems to play the same part, regardless of the movie. Compare Sheriff Bell to the role he played in In the Valley of Elah; also a lawman, on the other side of retirement, methodical, saddened by the younger generation, yet stoic about change. Is it really a great performance if it comes so naturally? Maybe so, but I found Bardem more interesting. 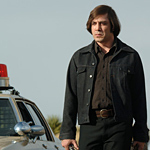 Bardem is excellent as the sociopath Chigurh. He exudes tons of menace. He has a great presence without being too likeable. Chigurh is at home in the desert, riding the tide of fate like a Force of Nature. He’s not unlike the Lone Biker of the Apocalypse from Raising Arizona, only more gruesome. At least that’s how he sees himself — one of his intended victims calls him on it at the end and he seems just a little shaken. The film’s worst misstep is that Chigurh is ostensibly driven by the love of money, which rings false. It’s not entirely clear what this Force of Nature would do with money if he had it. No Country for Old Men is violent, and it’s even a little gruesome, but eventually the Coens let us off the hook, at least visually. This is not a slasher film, and murder is just as final and tragic when it happens off-screen. In fact, that might even force us to think about death, rather than just asking us to watch it like voyeurs. The most horrible murder is probably the least bloody one. It involves the person who was able to get under Chigurh’s skin, the one who showed him he isn’t a Force of Nature; that he is simply a bad man. The film ends on Jones, as Bell, recounting a dream. The description of the dream is vivid, but all the camera shows is Jones’ iconic face. The dream image offers just a glimmer of hope, which is a big favor to the audience, because the actual end of the story offers no closure. That the image is only recounted by someone who’s seen it — that we don’t get to see it filmed — makes the glimmer all the more rare and valuable. If it were the last film Jones ever made, it would be an incredible finale to a great career. Don't read this review til after seeing the film!